After Green tea, it is the turn of Chamomile Tea to make headlines. Chamomile tea has made it to the popularity charts with the latest study claiming that drinking chamomile tea can help in boosting longevity. Drinking chamomile tea can be particularly beneficial for women, over 65 years of age, as it can considerably reduce the risk of death from many causes, the study confirmed. Chamomile is one of the oldest and most widely used medicinal plants in the world, recommended for various healing applications. Consuming chamomile tea helps in 29 percent decrease in risk of death due to various causes among women, in comparison to non-users. However, the study did not specify the reason for particular emphasis on women in the report. But it is generally believed that women consume chamomile tea more than men. 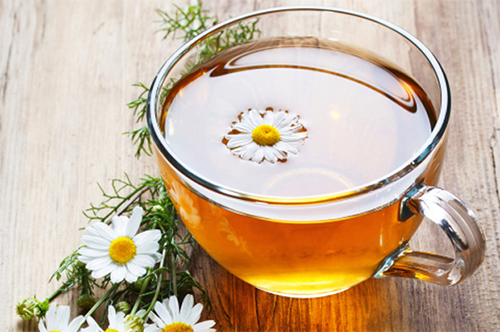 The study was conducted over a seven year period, during which, researchers tracked the effects of chamomile tea and cause of death in 1677 women and men over age 65 years. The researchers however said, it is still unclear how the use of chamomile was associated with decreased mortality. Further, recent studies have also shown potential benefits of chamomile in treating hyperglycemia, diabetic complications, upset stomach, cholesterol lowering, antimicrobial, anti-inflammatory, anti-platelet and anxiety disorders. Further, did you know that chamomile tea can work wonders as a beauty aid too? Chamomile tea bags help reduce under-eye dark circles and soothes tired eyes, when blended with powdered milk chamomile tea works as a great facila scrub, when consumed on regular basis chamomile tea provides moisturization and nourishment to the skin, it brightens up the blonde hair instantly, is a wonderful hair lightener, and prevents and eliminates dandruff. Ayurveda has always believed in the immense health benefits of chamomile. Ayurveda believes that chamomile oil helps in reducing excess kapha and pitta doshas. Chamomile oil is considered to be safe enough to be used on babies, and it is believed to pacify and calm irritable babies. About 2 drops of chamomile oil can be added on bed linens or on the baby’s pillow. Else, mix a drop of chamomile oil with 10 drops of virgin olive oil and massage on your baby’s tummy to get rid of pain or colic. Among adults too, it has been recently found that chamomile extract therapy helps treat mild to moderate Generalized Anxiety Disorder, wherein the calm and relaxing effects of the oil help in sedating the system and stimulating good sleep. Just add 2 to 3 drops of the oil to a tissue placed near your pillows. The oil (5-6 drops) can also be added to warm bathing water in the night before going to bed. It helps in tranquilizing the nervous system. Chamomile essential oil has wonderful anti-inflammatory properties too and helps reduce pimples, blackheads, itchiness and heat rashes during summer. It is also said to reduce discomforts associated with psoriasis, eczema, diaper rashes, skin ulcers, bruises, sunburns and other skin conditions. Mixing three drops of Chamomile oil with 1.5ml of almond oil and massaging on affected parts of the skin helps in healing of wounds, cuts, blisters, and other skin problems. Chamomile essential oil has carminative, stomachic, digestive properties, thereby supporting the digestive system and stimulating the metabolic functions. It is used in Ayurvedic healing in the treatment of flatulence, dysmennorhea, headache, nervous disorders in children, amenorrhea, colic, insomnia, depression and negative feelings.